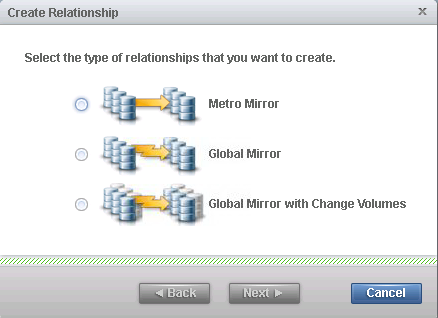 The Metro Mirror and Global Mirror Copy Services features enable you to set up synchronous and asynchronous replication between two volumes between two separate IBM storage, so that updates are made by an application to one volume in one storage systems in prod site are mirrored on the other volume in anther storage systems in DR site. The Metro Mirror feature provides a synchronous-replication. When a host writes to the primary volume, it does not receive confirmation of I/O completion until the write operation has completed for the copy on both the primary volume and the secondary volume. This ensures that the secondary volume is always up-to-date with the primary volume in the event that a failover operation must be performed. However, the host is limited to the latency and bandwidth limitations of the communication link to the secondary volume. The Global Mirror feature provides an asynchronous-replication. When a host writes to the primary volume, confirmation of I/O completion is received before the write operation has completed for the copy on the secondary volume. If a failover operation is performed, the application must recover and apply any updates that were not committed to the secondary volume. If I/O operations on the primary volume are paused for a small length of time, the secondary volume can become an exact match of the primary volume. Both systems are connected via fibre for replication over FC. Both systems have up to date and latest firmware. Easy Tier and SSD installed in both systems. Remote Copy license activated in both systems. Volumes are identical in Prod and DR SAN. Activate Remote Copy and Easy Tier License. Both systems will communicate via management network but volume will be replicated via Ethernet if remote copy is configured to use replication over Ethernet. This step is necessary for Metro Mirror over Ethernet. Skip this step if you are using FC. Log on to Production IBM v3700 systems. Settings>Network>Ethernet Ports. Right Click on Node1 Port 2> Configure Copy Group1 and Copy Group2. Assign IP address, Enable iSCSI, Select Copy Group1. Repeat to Create Copy Group2. 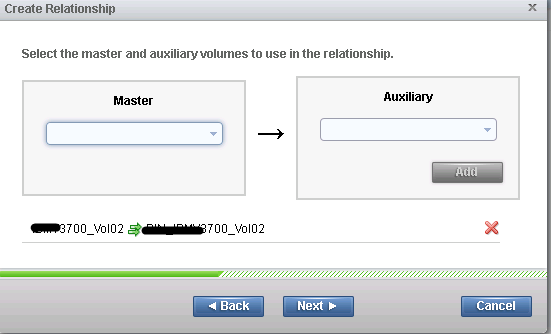 Repeat the step to configure Copy Groups in DR SAN. Note: TCP/IP assigned in DR SAN can be from same subnet of production SAN or can be different than production subnet as long as both subnets can communicate with each other. Fully Configured Indicates that the partnership is defined on the local and remote systems and is started. Initial synchronization bandwidth is 2048MBps but once I take the DR storage to DR site. I will modify that to 1024MBps. Initial Synchronization will take place in prod site. You can have your own bandwidth specification. 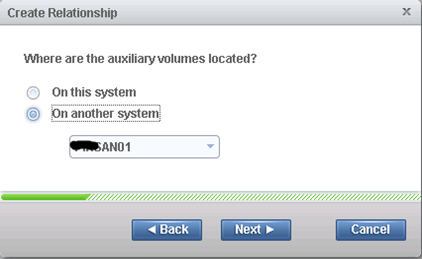 Specify DR SAN as Auxiliary Systems where DR Volume is located. IBM should have used word “Master/Slave” or “Prod/DR systems”. 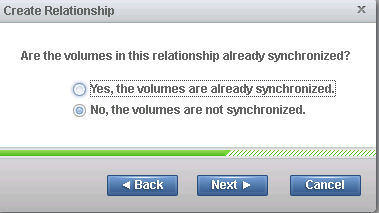 Consistent (synchronized) – The primary volumes are accessible for read and write I/O operations. The secondary volumes are accessible for read-only I/O operations. Inconsistent (copying) – The primary volumes are accessible for read and write I/O operations, but the secondary volumes are not accessible for either operation. This state is entered after the startrcconsistgrp command is issued to a consistency group in the InconsistentStopped state. This state is also entered when the startrcconsistgrp command is issued, with the force option, to a consistency group in the Idling or ConsistentStopped state. The intersystem link is not able to process the background copy I/Os fast enough, and the I/Os can back up (accumulate). For Metro Mirror, there is a delay in the synchronous secondary write operations of foreground I/Os. For Global Mirror, the work is backlogged, which delays the processing of write operations and causes the relationship to stop. For Global Mirror in multiple-cycling mode, a backlog in the intersystem link can congest the local fabric and cause delays to data transfers. The foreground I/O latency increases as detected by applications. If the background copy bandwidth is set too high for the storage at the primary site, background copy read I/Os overload the primary storage and delay foreground I/Os. If the background copy bandwidth is set too high for the storage at the secondary site, background copy write operations at the secondary overload the secondary storage and again delay the synchronous secondary write operations of foreground I/Os. 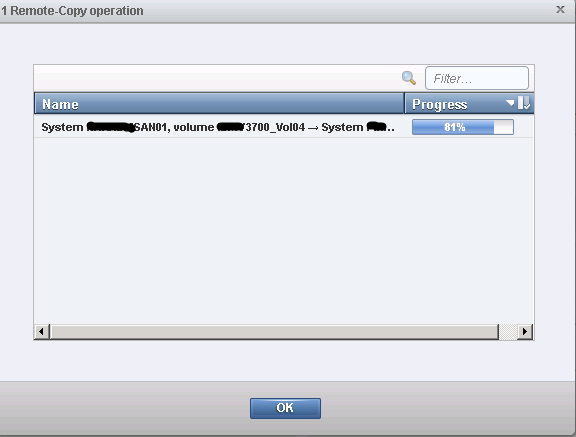 Once volumes are synchronized you are ready to integrate storage with System Center 2012 R2.